Giant Japanese mobile phone operator NTT DoCoMo is set to make a surprise move to bring its cutting-edge services overseas when it launches in the US some time next year. According to Japan Today, so-called "sources familiar with the matter" say the move is likely to involve DoCoMo's i-mode brand, which is the name it gives to its walled garden of internet services. Given the cost of setting up a mobile phone network, it seems sure that the company will lease bandwidth from a partner like AT&T or T-Mobile, rather than build its own infrastructure. While any new (to the US) kind of internet offering like i-mode is likely to be about as successful as WAP was a few years ago, the more intriguing prospect is the likelihood of DoCoMo exporting its genuinely innovative services that are so popular at home. 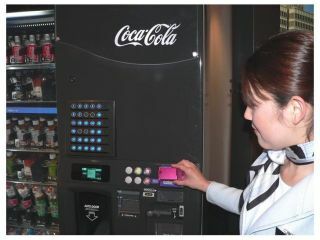 Of those currently available in Japan, the most likely to succeed abroad are the RFID-based e-cash/travel pass offering built into most new DoCoMo phones and, possibly, on-handset electronic credit cards.